Argonne National Laboratory, under the stewardship of the Department of Energy, just released a study that found wind energy does not reduce carbon dioxide emissions from electricity generation as much as expected due to the need to ramp up fossil fuel plants when the wind is not blowing. It takes more energy and thus more carbon dioxide emissions to ramp a coal plant up and down than if the same coal plant is operated at a continuous, efficient base-load level. This is not a new finding. A study by Bentek Energy[i] identified this phenomenon about 2 years ago, and the findings are summarized by IER here. [ii] The difference in the studies is that Argonne evaluated Illinois electricity market data and Bentek evaluated the analogous situation in Colorado and Texas. But, the findings are essentially the same. The Argonne study, System-Wide Emissions Implications of Increased Wind Power Penetration, examines the environmental effects of incorporating various levels of wind energy in the Illinois electric power system. [iii] Illinois has a renewable electricity standard that mandates that 25 percent of its electricity be generated from renewable energy by 2025. In 2010, wind power generated only 2.2 percent of the state’s electricity. [iv] Because of the standard, renewable energy must be used by the system operators to achieve the targets mandated. The Argonne analysts modeled different wind penetration levels in the Illinois system, whose generation is heavily coal-based. Their model represents the effects of cycling coal and natural gas plants on and off as wind energy is either producing less or more electricity based on when the wind is blowing. 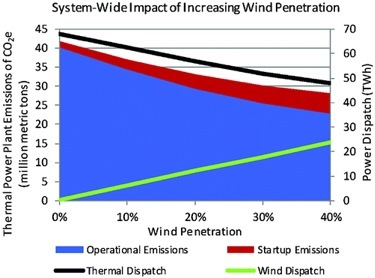 In their modeling, Argonne researchers analyzed the impact of increasing the level of wind penetration on carbon dioxide emissions and incorporated the impact of cycling the thermal plants up and down to accommodate different levels of wind penetration and the larger fuel use and emissions associated with the start-up of those plants. The analysis shows significant emission impacts from increased cycling and start-up of the thermal plants that reduces the net emission reduction expected from using the wind generators. When fossil fuel plants are operated at less than full power, they operate less efficiently from a fuel use perspective. Thus, when their demand is reduced to make room for wind power, which generally occurs at night when winds are the strongest, base-load fossil plants are cycled down. As the wind dies down, these fossil plants are started up again, using more fuel and releasing more emissions upon start-up. The concept is similar to the inefficient fuel use of a vehicle in stop-and-go traffic. Argonne researchers are working on a solution that entails using batteries to store the wind power for use when the wind stops blowing lessening the need to cycle down the conventional plants. Battery technology could also be used to store solar energy captured during the day for use at night. However, the use of battery technology to store electricity is not currently a commercially viable option. It is important to note that while wind may displace some pollution emissions, it is at a higher cost than just the cost of the subsidized wind turbine because of the need to have back-up power. Wind capacity does not displace actual fossil fuel plants—it displaces the generation from the back-up plants when the wind is blowing. When the wind is not blowing, the back-up plants are needed to supply the electricity needed to meet demand. Thus, the true cost of wind power should include the cost of building plants to back up the power when the wind dies down. Ratepayers are actually paying twice–once for the wind turbines and secondly for the capacity to back them up. It would be cheaper for ratepayers to build new plants to replace older plants given the small, marginal reductions in carbon dioxide that are obtained from wind power. Further fossil fuel plants are not the only plants that may be affected by additional wind power. For example, if there is enough wind on the system that all the fossil fuel plants are cycled down, nuclear power plants then may be affected. Mayo Shattuck, Executive Chairman of the Exelon Corporation, indicated that because wind turbines tend to generate the most power when that power is least needed, and because federal subsidies allow operators to bid the power into grid markets at a price of zero, undercutting all other generation, nuclear plant owners, whose power cannot be cycled easily, end up paying the grid to take their power. [vi] Those costs increase electricity prices as well. Bentek Energy also found this to be the case in its study of the issue using electricity data for Colorado and Texas. The Bentek and Argonne studies show that the amount of emissions reductions from increased wind power generation is largely dependent on the type of power plants in the system. For example, coal plants use more fuel and emit more emissions when they are cycled than natural gas plants because they were designed to operate continuously at base-load. Argonne’s suggested answer to the dilemma caused by forcing more expensive and intermittent renewable energy sources into the grid is to spend more money on the development of storage batteries to store electricity when the wind doesn’t blow and the sun doesn’t shine. An observant taxpayer or policymaker reviewing the facts might conclude that, rather than continuing to compound government spending and increase consumer costs for energy through government subsidies and mandates, it is government policies which keep causing problems in the first place. If that is the case, the best remedy would be to avoid doing the harm in the first place.